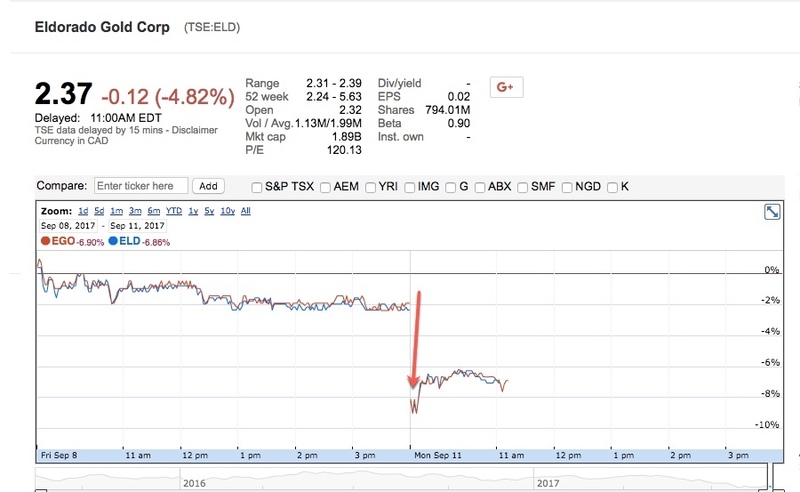 Canada's Eldorado Gold’s (TSX:ELD)(NYSE:EGO), Greece’s biggest foreign investor, has decided to suspend all operations in the country due to government delays in issuing permits for Skouries and Olympias, two of the company's key projects. Chief executive George Burns said in the statement the company was “unable to continue investing” in Greece because of the lengthy wait for the necessary licences, which has negatively impacted Eldorado's project schedules and costs. The suspension will take effect on Sept 22 and includes all of the company’s budgeted investments in exploration, community and infrastructure development. "It is extremely unfortunate to find ourselves at this impasse when we should be advancing an important commercial project in partnership with Greece and adding another 1,200 jobs to our current workforce of approximately 2,400 people in Greece," Burns said. Shares fell on the news, trading almost 7% lower than their closing price Friday in both, the Toronto and New York exchanges. Environmental protection works and care and maintenance activities will continue, the Vancouver-based miner said, adding it expects to spend about $30 million in the operations shut-down, with sustaining maintenance costs of approximately $25 million a year. Not including Stratoni’s $2 billion acquisition, Eldorado has invested about $1 billion in the European country since 2012, and such figure would double if the company could fully develop its other assets in Halkidiki, northern Greece, the company said. 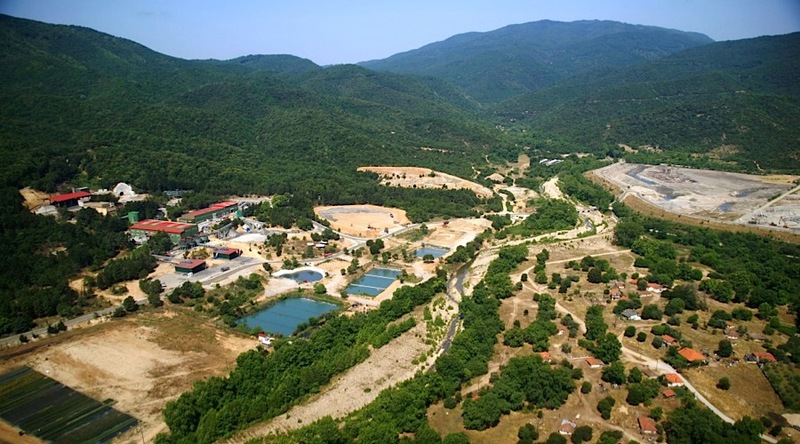 The gold miner, which already operates Stratoni, has been trying to develop the Skouries and Olympias projects in the north of the country for years, but local opposition and an ongoing back-and-forth with authorities have delayed progress. Several in the community oppose mining in the area because they believe the activity would hurt the regional tourism industry, destroy forests and pose a contamination risk to the groundwater. Eldorado counters that together with generating new jobs and bringing hundreds of millions into Greece’s struggling economy, it has taken all necessary measures to protect the surroundings. Further, the miner says it’s still carrying out environmental clean-up work even of its predecessors. One of the biggest differences between the company and Greek authorities revolves around testing methods applied to comply with environmental regulations at Skouries. Eldorado has slowly reduced its international footprint in the last two years, beginning with the sale of all its Chinese assets in 2016 and this year’s decision to indefinitely shelve expansion plans for Kışladağ mine. The miner also deferred recently a decision on developing a project in Brazil, citing low gold prices, and went through some leadership changes, with the appointment of one of Goldcorp's top executives as CEO. Instead, the company is seeking to strengthen its position in its home country. 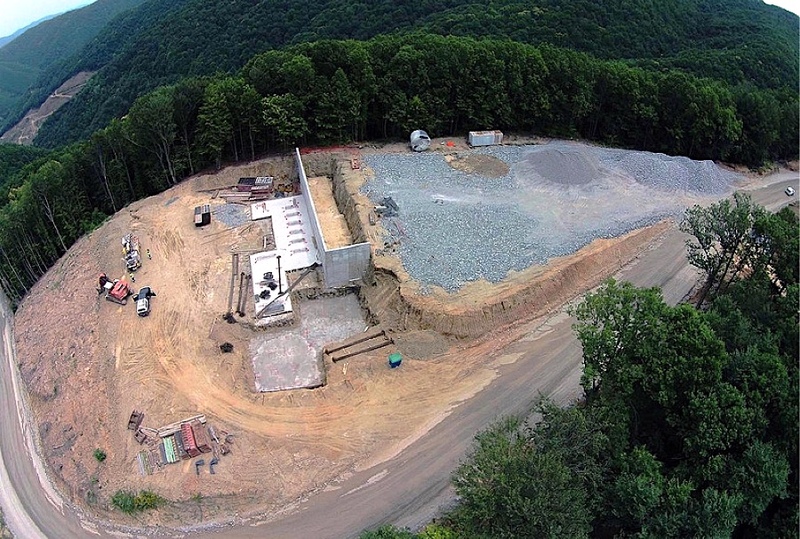 In July, it completed the acquisition of fellow Canadian miner Integra Gold (TSX-V:ICG), gaining access to the Lamaque project near Val-d'Or, Quebec. That asset has potential to produce 123,000 ounces of gold annually on average over 10 years, according to a preliminary economic assessment completed in February. This is not the first time Eldorado has halted operations in Greece, but definitely the most drastic one. In January 2016, it suspended work at Skouries and threatened with laying off 600 workers following protests by local residents and yet another fall-out with the government. Work resumed about five months later.